Rebecca Minkoff is a global lifestyle brand and industry leader in fashion with designs that are playful and edgy. They have high end apparel, handbags, footwear, jewelry, and accessories with three domestic retail stores, two international locations, and hundreds of distributors worldwide. 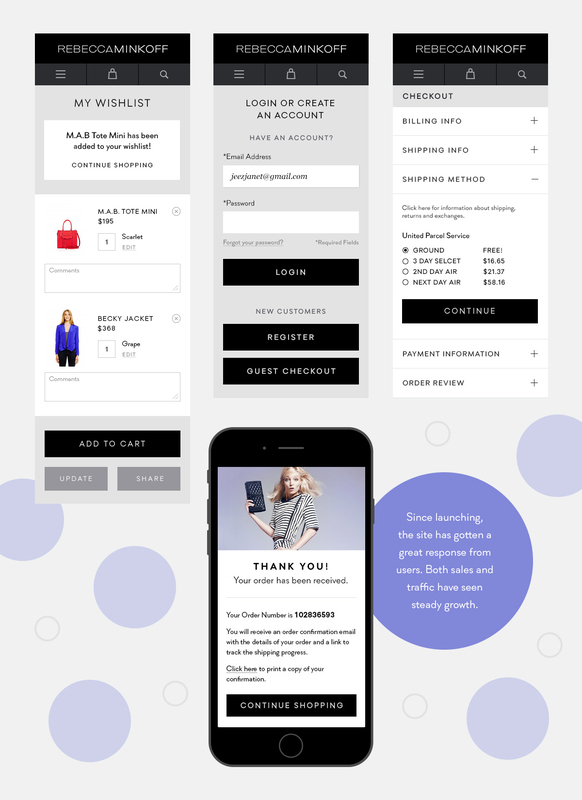 We worked on the Rebecca Minkoff mobile site design with the development firm Gauge Interactive in Savannah, Georgia. We were tasked with creating a modern mobile site that was not only consistent with the brand, but also incredibly user friendly. Based on the Magento ecommerce platform, the site was a fully custom design and build. The overall design had to remain consistent with the Rebecca Minkoff brand aesthetic – clean, modern, and high fashion. We were able to have some fun and get creative with the user interface design and subtle animations. The homepage and header area are designed minimally with just the menu navigation, shopping bag and search. We added a large slideshow with navigational elements and a swipe feature. The product page features a photo and video slideshow area, large, modern text and custom designed menus. We custom designed every page right down to the wishlist, customer account pages, and checkout process. 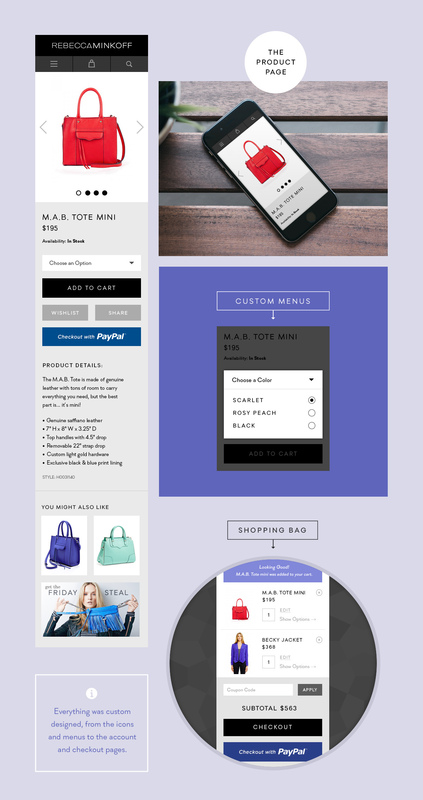 We also created the email notifications and newsletter templates for the brand.